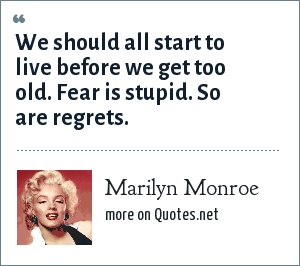 Marilyn Monroe: We should all start to live before we get too old. Fear is stupid. So are regrets. "Marilyn Monroe Quotes." Quotes.net. STANDS4 LLC, 2019. Web. 24 Apr. 2019. <https://www.quotes.net/quote/73953>.